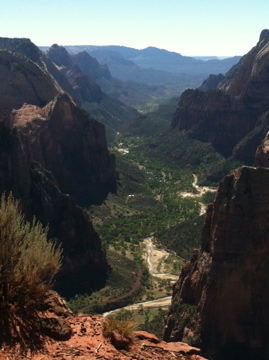 David and I were already planning to hike the East Rim Trail in Zion National Park today. The trail head is only a few miles down the road from where we’re staying, just inside the east entrance to the park, and we were looking for a less crowded area to hike. We also knew the government was probably going to shut down and we figured this would be an easier place to access the park. We knew we’d get past the entrance, because Utah State Route 9 runs through the park. At the entrance the ranger in the booth told us the park was closed, that we could only drive through on Rte. 9 and couldn’t stop anywhere on the road. So we drove the 100 yards to the turn off for the trail head and pulled in. Just before the parking area, the gate was closed. I got out of the car, untied the yellow caution tape (Caution, Congress in Session? ), opened the gate and David drove through. We parked and started our hike. 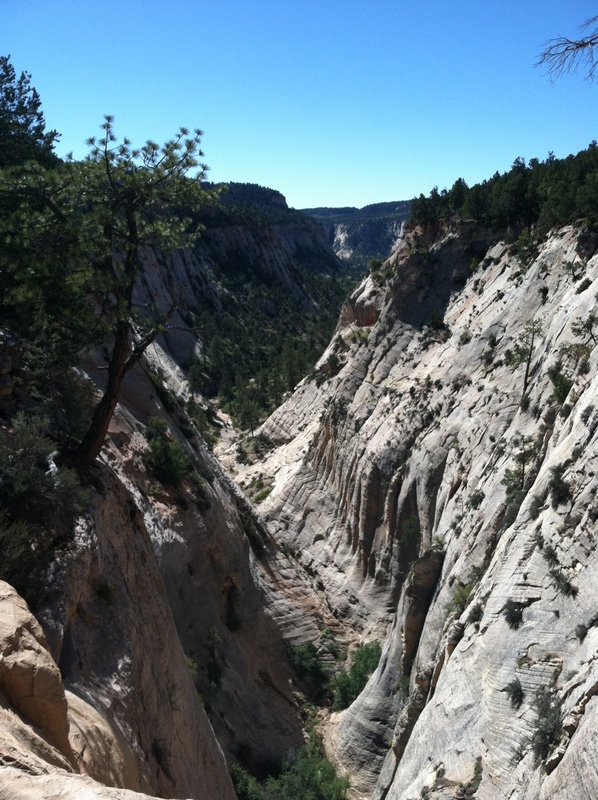 The trail was beautiful, less majestic than in Zion Canyon, but quiet and still full of an amazing variety of rock formations and views of cliffs and tree topped mesas. We only saw 6 other people during our morning hike — on most Zion trails you see 6 people in the first minute of the hike. 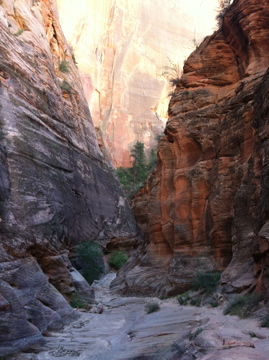 A man and his son were sitting at the top of Jolly Gulch, looking down the canyon when we arrived. “We’re practicing civil disobedience,” I said. 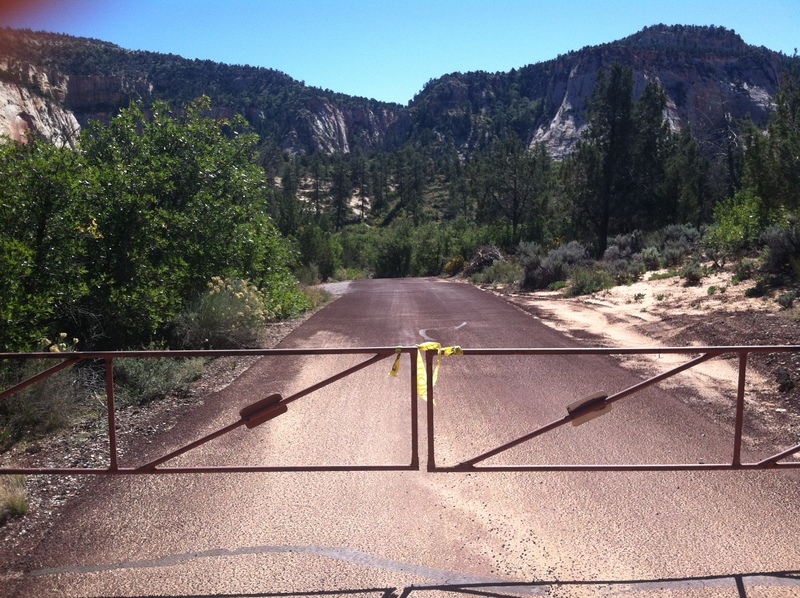 “The parking area at the trailhead was gated, but we just opened the gate and came in.” The man nodded. “I had the same thought,” he said. 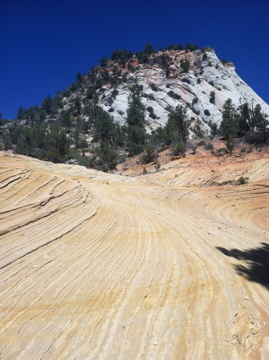 He and his son had driven a back road to the boundary of the park, just behind the canyon and walked in. “This is a good place to be today.” Hiking back to the trial head we met two couples on the trail. They’d parked just outside the entrance of the park and walked in. They couldn’t go hiking from the park campground where they were staying, because they were told “you can’t recreate in the park.” They have to leave their campsite by tomorrow. So today no one got to hike to Observation Point, which we did yesterday, unless they did a very, very long hike in from the East Rim Trail (another 7 miles from where we turned around today, then you’d have to come back). 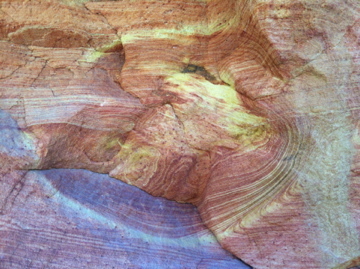 It was a grand hike, up through part of Echo Canyon, where the red sandstone has been washed into curves and ripples. 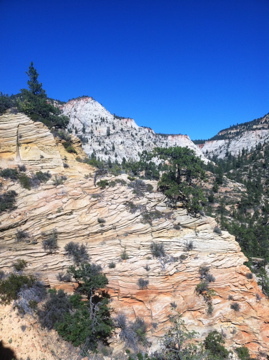 Following switchbacks up the cliff faces, we reached the top of the mesa and walked through scrub vegetation, out to a point with views down Zion Canyon. Tomorrow we’re headed for Bryce Canyon National Park, and we’ve been studying topo maps to figure out how to get into the park and hike. And we will get into the park and hike. Woody Guthrie had it right. You go, girl! Enjoy your hike in Bryce, too! Just finished up a four-day hiking trip back east in the NH Whites. Glorious weather. If somebody’d tried to yellow tape my hike I would have done the same as you. We’re citizens and tax payers. We OWN the damn parks! Good for you, no, that’s beyond good. Awesome! These lands belong to us all, they’re our birthright. It’s stupid and ridiculous that we should be kept away from our public lands because some morons in the wrong Washington are overgrown children. I have a permit to climb Mount Saint Helens on Saturday, I’ve been looking forward to it since February. I’m trying to gather some info about how feasible this is going to be now before I make a long, long trip down there, quite possibly to find the road gated 20+ miles away from the mountain itself. Good luck with your hike. I hope you make it. 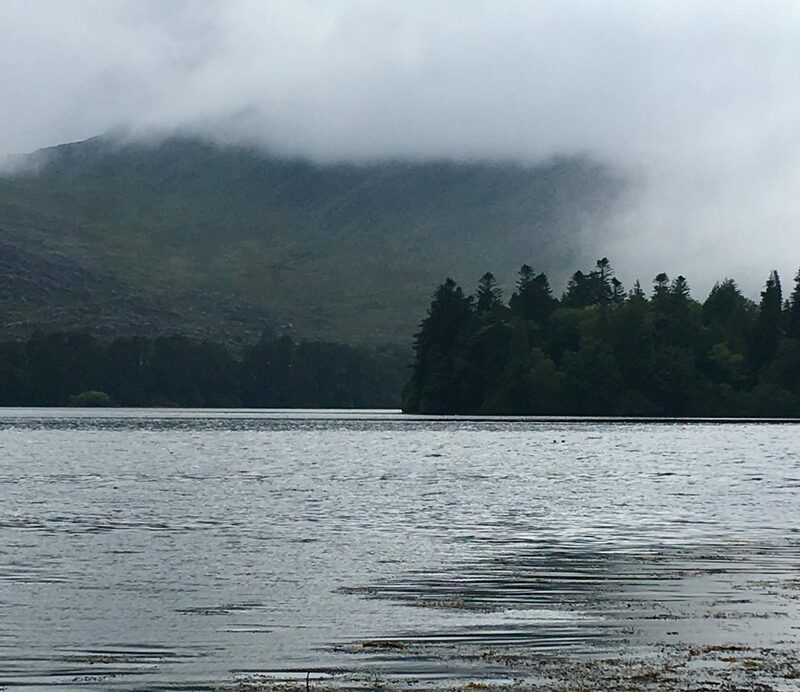 Love it -it’s our land – and gorgeous it is. Keep on keeping on.